With Bristol Old Vic’s new Weston Studio in full swing, Ferment are stepping up to the plate with three new productions coming to Bristol this October. 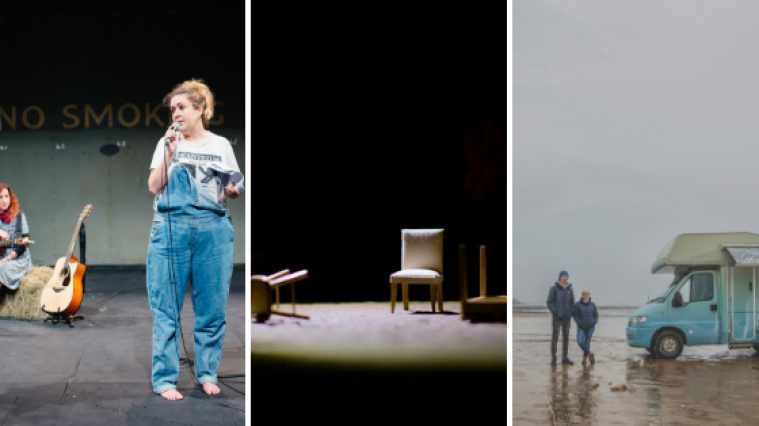 Bristol Old Vic’s Ferment department centres on artist development by representing a vibrant community of theatre-makers from Bristol and the South West with whom they support and develop exciting and adventurous new work. From 16 – 20 October, Ferment will be presenting a double-bill of Amy Mason’s Hollering Woman Creek and Vic Llewellyn’s A Little Death, before concluding its takeover on Oct 20 with a one-night-only sharing of Action Hero’s Oh Europa, taking place – in a motorhome - just outside the front doors of the new foyer. Hollering Woman Creek was first staged as a scratch performance during Ferment Fortnight in January 2018 and is now returning as a fully-fledged production. Hollering Woman Creek is an autobiographical spoken word show by theatre maker, stand-up comedian, novelist and Bristol-favourite Amy Mason. Her 2014 debut novel The Other Ida won the Dundee International Book Prize while her previous project, the lo-fi musical The Islands won the Ideas Tap/Underbelly Edinburgh Award, followed by a national tour. Amy was also a finalist in the 2018 Funny Woman Awards. In 2015, newly pregnant and just off her psych meds, Amy Mason travelled around Texas to research the death penalty for her new novel. Hollering Woman Creek follows Amy as her mental health goes haywire in one of the brashest, biggest, and most baffling of US States. The show features an original soundtrack by multi-award winning musician Megan Henwood and is presented in collaboration with Bristol Ferment. It will run at 7pm in the Weston Studio from 16 – 20 October. Audiences will be able to catch the second show of this Ferment double-bill at 9pm. Vic Llewellyn’s new show A Little Death deals with themes of mass hysteria, loss and the need for positive change. Bristol-native Vic recently charmed local audiences with The Castle Builder, a collaboration with Kid Carpet at Mayfest 2016, and returns with this new play about fictional William Williams, programmed by Ferment. In April 1942, William Williams steps on a booby trap, which blows off most of the toes on his left foot and leaves the edge of his shinbone like the surface of the moon. On returning home, he continues where he left off – he’s the local butcher, just like his dad before him. Wrapping up the Bristol Old Vic Ferment takeover is Oh Europa, a live art performance taking place in a motorhome parked outside the theatre. For six months in 2018, Action Hero have been travelling over 30,000km across Europe in a motorhome, recording love songs sung by the people they meet. Fresh off the boat, they’ll be driving back into Bristol and straight to Bristol Old Vic for a homecoming celebration. They invite the people of Bristol to come and sing them a final love song. Those songs, along with thousands of others, will then be broadcast 24/7 from beacons located at various locations across the continent. As Bristol marks the final stop on their journey, Action Hero will be sharing songs of their trip with audiences, shining a light onto the ever-evolving archive of music they’ve discovered and exploring the invisible boundaries, margins, cultural junctures and geological edgelands of the continent they have visited. They will pull up at Bristol Old Vic on Sat 20 Oct at 6pm.